It has become a welcome tradition over the years to see the words "James Bond Will Return" at the end of each film’s credits. Without showing us anything, it’s always been a subtle reassurance that in a few years’ time 007’s next adventure will be around the corner. Where will he go? Who will he fight? Those are questions that should only be answered, not by M., but the movie trailer itself. Intrigue. Suspense. Danger. Action. These are just some of the words that can be used to describe what makes the James Bond film franchise tick. Think of each film as a delicate house of cards. If one crucial element is not in place, the whole thing comes crashing down. However, certainly no one would ever dream of relegating 1963’s classic 'From Russia With Love' to this fallen pile. The film, as well as Fleming’s original 1957 novel, still stands as one of the strongest highlights of the series to date. It wouldn’t be a proper analysis of the movie if I didn’t invoke the name of SPECTRE! For this trailer, the villainous organization is back and more present than ever. While referred to in 'Dr. 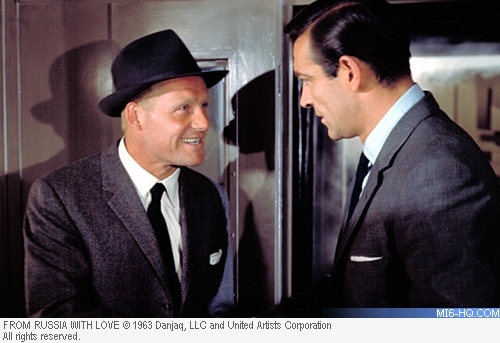 No,' it’s really takes a firm hold on the James Bond franchise in 'From Russia with Love.' You only have to look no further than Robert Shaw’s chilling introduction as 'Chief Executioner of SPECTRE.' Then, in case you forgot what SPECTRE stands for, the full unabbreviated title is splayed across the screen for no particular reason at the trailer’s end. Subtle this trailer is not! Surprisingly, for what the editors do show us they made a wise choice to keep Blofeld’s appearance, with white cat in toe, a secret. It just goes to show that in the world of 007, some things are still for our eyes only. In its fifty years, 'From Russia with Love's trailer hasn’t lost any of its cinematic lustre. Watching it now only proves that Broccoli and Saltzman knew exactly what they were doing at this early and formative period in the James Bond franchise. They played to 007’s strengths and, in the process, created the concept of event movie going that continues to this day. For that we can all be grateful.